This park honors Christopher John Siedenburg (1969-1994) a dedicated Staten Island fireman. A lifelong resident of Great Kills, he saw fighting fires as the finest expression of his greatest goal, helping people. Throughout his time at Monsignor Farrell High School and his two years at the College of Staten Island, Siedenburg worked as a newspaper carrier, restaurant worker, lifeguard, and at several other jobs. He then joined the Volunteer Heart Resuscitation Unit of Staten Island (VHRU) and trained as a State Emergency Medical Technician. The many hours that he devoted to the VHRU each week earned him both awards and recognition. As soon as he was eligible, Siedenburg entered the Fire Department of New York (FDNY) training program. After passing the written test, he achieved a perfect score on the highly challenging physical tests. On September 8, 1991, he became a New York City firefighter assigned to Engine 24 in Greenwich Village. He continued to volunteer with the VHRU on his days off. This dedicated man had only been on the job for two and a half years when he was badly injured in a SOHO fire on March 28, 1994. The EMT who transported Siedenburg to the Cornell Burn Center later told his family that despite severe pain from his burns, Christopher had said that “being a firefighter is the greatest job in the world, helping people.” He died the next day at age 25. Siedenburg Park on Greaves and Dewey Avenues was named in 2001 to celebrate and remember his courage and his generosity of spirit. The park, formerly known as Evergreen Park, was created in 1982 as the result of a land exchange deal between the City and the Arthur Walkill Corporation of real estate developers. The company provided the land and a $75,000 trust fund to be used for its maintenance in exchange for another City-owned parcel of land elsewhere on the island. Through an arrangement with Parks, the Staten Island Institute of Arts and Sciences managed this property, providing educational programs as well as security for the park until 1989. Since then, Parks has been responsible for all maintenance. Bird watchers and hikers alike appreciate the site’s varied topography and diversity of wetland wildlife, while researchers and scientists benefit from the site’s unspoiled natural environment. 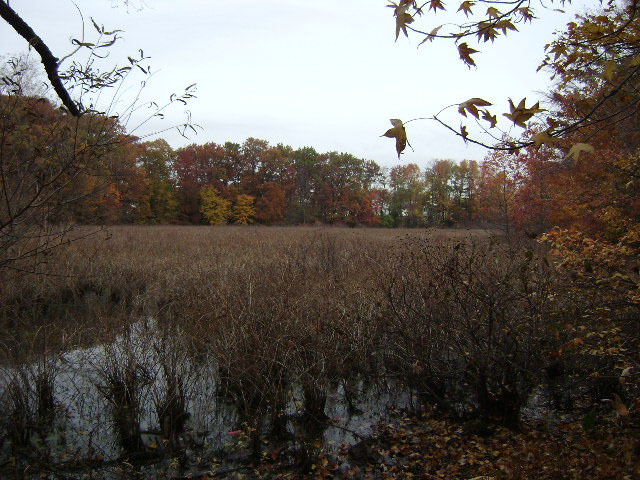 The parkland sustains a broad assortment of wetland wildlife in both ponds and reedy swamps. At its entrance, the park welcomes visitors with many beautiful, full-grown junipers and a variety of evergreen shrubs. The Greaves Avenue expanse overlooks the swamp which is home to the park’s many birds, among them great blue herons (ardea herodius), mallard ducks (anas platyrhynchos), egrets (casmerodius albus), green herons (butorides striatus), and red-winged blackbirds (agelaius phoeniceus). A large section of the park is covered by oak forest and hosts several varieties of ferns, pink-ladies-slipper orchids (cypripedium reginae), wild blueberries (vaccinium), azaleas and other, similar shrubs. Some evergreens and Red maples (acer rubrum) can also be found in this vast woodland and unique species to this park, such as royal ferns (osmunda regalis), netted chain ferns (woodwardia), and Indian cucumber roots (medeola virginiana) are abundant.